NEW YORK (WABC) -- New York State's Department of Motor Vehicles debuted a brand new 9/11 remembrance license plate to benefit a good cause. The plate honors those lost in the September 11th terror attacks with iconic phrases like "Never Forget" and "United We Stand." It also features an American flag and silhouettes of rescue workers. Assigned plates cost $85 each with an annual renewal fee of $56.25, and personalized plates cost $116.25 with an annual renewal fee of $87.50. For each plate, $25 of annual fees support the World Trade Center Memorial Scholarship Fund, which provides access to a college education for dependents of 9/11 victims. 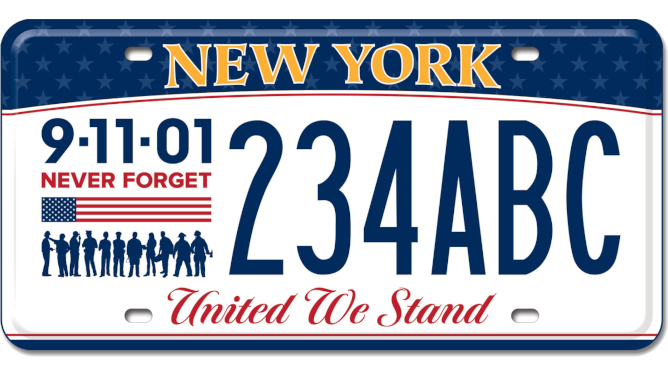 New York residents can order these plates online at dmv.ny.gov, by phone at 1-518-402-4838, by mail, or at a DMV office.